photo: Anirban Sen Gupta Images from Anirban Sen Gupta&apos;s research on natural and artificial platelets. Image (i) shows natural platelets attach to injury surfaces and cluster with help from artificial platelets. 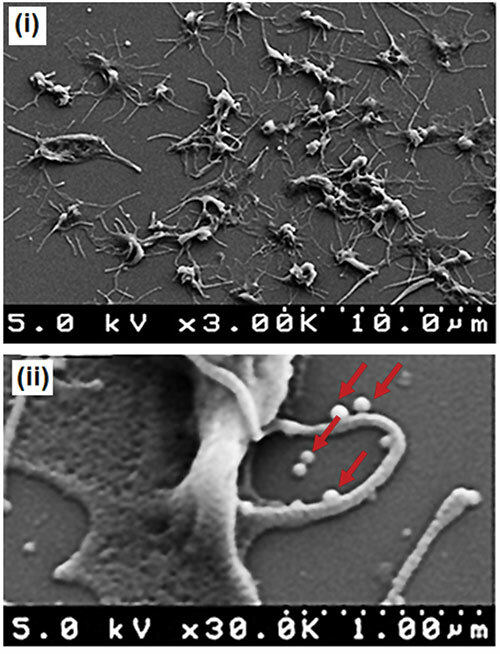 Image (ii), at 10 times the magnification of the first image, shows artificial platelet nanoparticles (indicated with the red arrows) bound to the membraneof natural platelets. The artificial platelets are about 500 times smaller than the natural platelets. Biomedical engineers at Case Western Reserve are leading groundbreaking research to change a tragic fact: Too many people die on the battlefield, in car crashes or in surgery because of blood loss. The engineers are tackling the issue in two separate research efforts that involve different technologies, approaches and applications. But the fundamental goals are the same: to develop artificial platelets that can speed up and expand the formation of clots to both reduce internal bleeding and address bleeding disorders. They also are investigating ways to use the platelets to deliver medicine to targeted sites in the body. Erin Lavik, ScD, Elmer Lincoln Lindseth Associate Professor in Biomedical Engineering, has developed an artificial platelet with a degradable polyester core that helps natural blood platelets clot faster. In a study published in June in Proceedings of the National Academy of Sciences of the United States of America, Lavik&apos;s team reported that the platelets not only improved the chances of immediate survival, but also led to no complications in the following three weeks. In a 2009 study, Lavik&apos;s team showed that the platelets, made of a biodegradable polymer, stopped internal bleeding 50 percent faster than natural platelets did. They have filed for several patents on the technology and are examining the possibility of using their platelets to deliver drugs to victims of blasts or traumatic brain injuries. While human trials are at least five years away, Lavik believes the technology could eventually halt massive internal bleeding—and its devastating results. "And that&apos;s the biggest reason young people die after trauma," she said. "If we could halt that, it would be great." 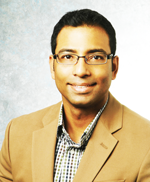 Anirban Sen Gupta, PhD, associate professor of biomedical engineering, and his team are focused on creating a synthetic-platelet design using lipid particles that can speed clotting to limit traumatic bleeding and potentially treat congenital or drug-induced clotting disorders. In March, his team—which includes researchers from Cleveland Clinic—received a five-year, $1.9 million National Institutes of Health grant to refine the design of their injectable artificial platelets that halt bleeding by sticking to bleeding sites and signaling natural platelets to home in on them. Not only do the artificial platelets hold the promise of faster clotting, but they also last longer than natural platelets from donors, which have a short shelf life. Sen Gupta and his team have filed for several patents in connection with the synthetic platelet technology and its potential applications. Sen Gupta said his team also is working to refine the artificial platelet design to deliver a range of drugs to targeted sites in the body. For example, they could be used to carry clot-dissolving drugs to blocked blood vessels, or carry chemotherapeutic drugs to metastatic cancers. "Platelets play a direct or indirect role in a variety of diseases," Sen Gupta said. "If we can exploit that in a synthetic-platelet design, we may be able to treat many diseases in a targeted fashion."